New pattern look at Ewe Ewe Yarns! I'm excited to show you my new pattern design! Our knitting and crochet patterns have had the same layout since I started Ewe Ewe in 2011 and now that we've grown to have over 150 patterns on the line it seemed like a good time to revisit a few things. 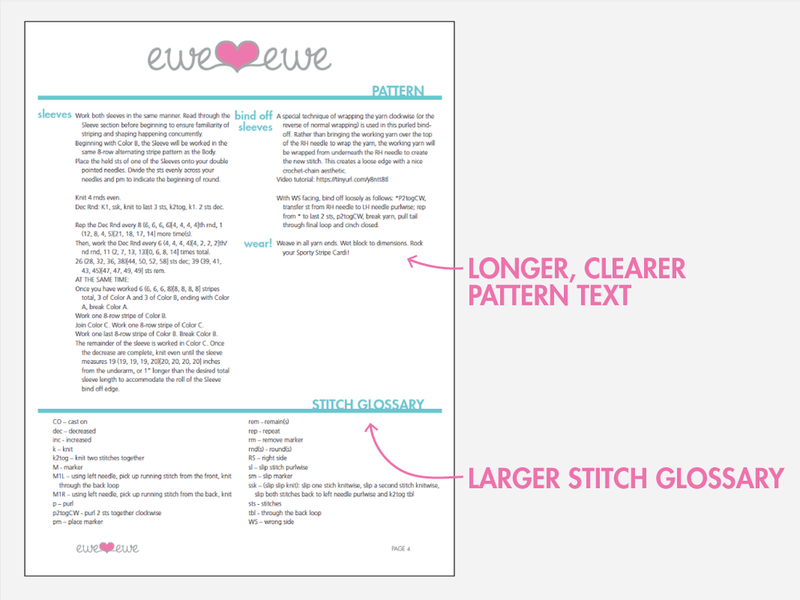 When Ewe Ewe began we mostly sold printed paper patterns and my design focused on being conservative with paper. I'd try to keep most patterns to a single page and only one side of that page if possible! Things have changed a lot in seven years. Most knitters buy their patterns digitally either from our website or Ravelry and that means saving paper isn't as critical. The majority of my knitting friends bring their iPad to knit night and like to have bigger, wordier patterns that focus on clarity rather than concise instructions. Encouraged by a fellow designer, I went ahead and reworked our pattern template! There are a lot of changes and I'm excited to show them to you. 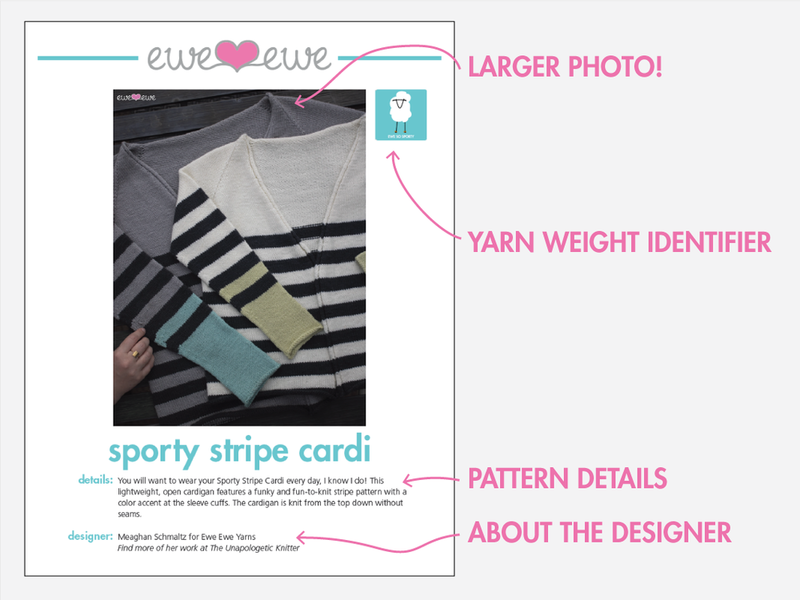 Now Ewe Ewe knitting patterns have larger photos, designer details, helpful info about the yarn and the pattern all in one place. The new layout brings a much-requested item -- a larger main photo! What's better than really having a lovely image of what you're knitting. This photo is nearly 4-times the size of the previous patterns. I've also color coded each pattern to coordinate with the yarn used for the design. This pattern features Ewe So Sporty merino and that means all the section identifiers are aqua and it also has its yarn identifier in the top right corner on the title page. If you hadn't noticed -- each yarn has its own color now. Ewe So Sporty is aqua, Wooly Worsted is silver, and Baa Baa Bulky is orange. Check out the yarn page and it will all make sense! I also added a description of the pattern along with some notes about the designer. It's always nice to learn more about both! Let's peek inside. As we turn the page the pattern specs like needle size, stitch gauge, and measurement are clearly listed at the top. I've also added a section for notes where we can talk about how the garment should fit or any extra techniques that might pop up in the pattern ahead. Then we get to the pattern. I went with larger text and a bit wider line spacing to really give your eyes a break. That way you can isolate the instructions you need when you need them. The other great thing that came up was page numbers (even I'm confused why I didn't have those before!). Along with larger pattern text we also expanded how much we write in the pattern. I don't mean that we've gone for excessively wordy patterns that have a conversation with you, but rather extra info where it might be helpful. I used to focus on writing patterns as concise as possible and sometimes that could bring up questions from knitters. Now we're trying to bring you all the knowledge right here on the pattern. Have a pattern question? Email us! And to wrap it up -- the last page of the pattern now includes additional garment photos with extra detail shots. Sometimes it's nice to see how a neckline is formed or where a color change happens and we've got you covered. Plus, there's a whole section on how to get in touch with me and Ewe Ewe Yarns in the Say Hello section. There's our Ravelry page, Instagram account (follow us! ), or Facebook, and my favorite, Pinterest. 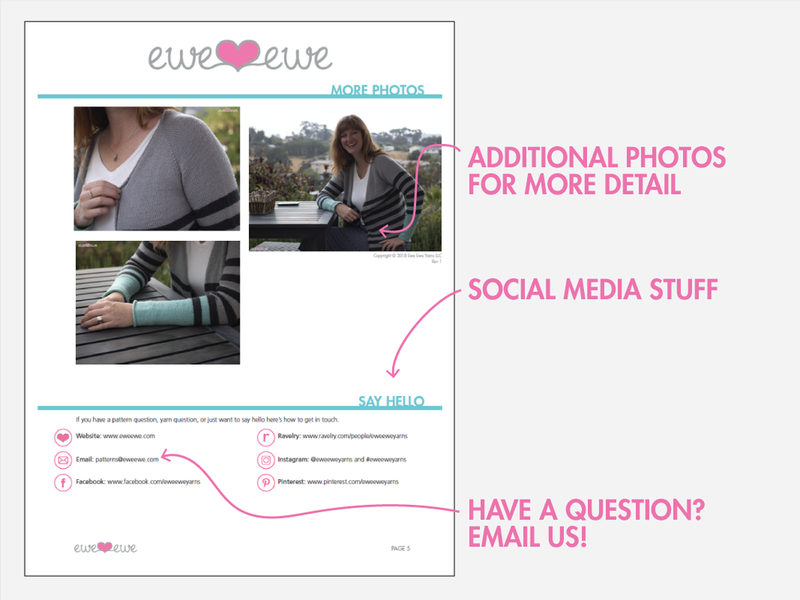 Also, if you have a question you can email us at patterns@eweewe.com. It's all right there on the pattern now. Awesome! The new pattern design is rolling out as we speak. I've updated a few of them including the Sporty Stripe Cardi shown here. Keep an eye out for this new look. Your next Ewe Ewe download might just be one of them! 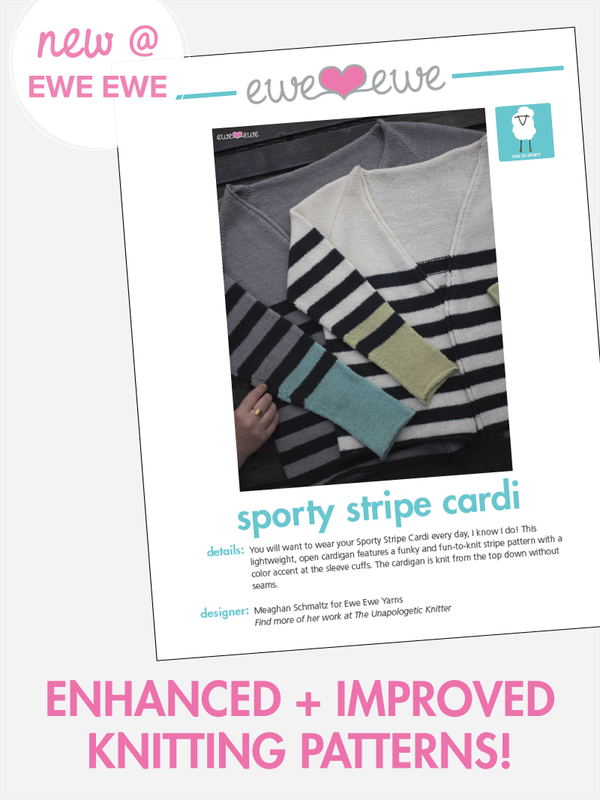 Want to make the Sporty Stripe Cardi? This is one of the best patterns on the Ewe Ewe line in my opinion. That's me in the photos and that's my Sporty Stripe Cardi that I have been wearing for 4 years. I love it! I knit it in colors that really work with my wardrobe and now it's my go-to sweater. Meet Basync Brioche. These two new cowls designed by Meaghan Schmaltz are knit in a simple brioche design and are a great starting project for a knitter new to this unique stitch. The cowls abruptly switch the main color and contrasting color at the midway point giving them a stunning graphic quality. Basync Brioche knitting pattern features two sizes. The small blue version is the perfect size to throw on to accent an outfit or tuck inside a jacket. It's 24" around and will be so squishy and soft. The green version worked in Soft Sage and Pistachio is a generous 61" circumference infinity scarf that can be wrapped two or even three times for a dramatic drape or super cuddly cowl. Give them a try! Get the Basync Brioche cowl on unapologeticknitter.com or on Ravelry. See Ewe So Sporty yarn. Published! My first magazine knitting pattern! "Designed by Heather Walpole." Hooray! It's fun to see your own name in print! 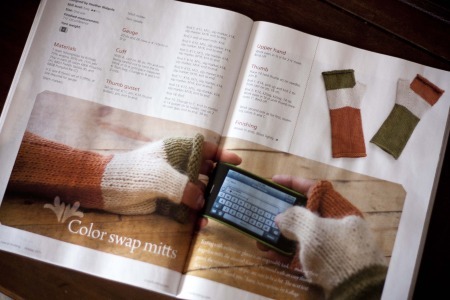 I'm very excited to see my Color Swap Mitts in the Holiday 2011 issue of Love of Knitting magazine. I designed these mitts to be long and kinda slouchy on the wrists. They're very comfortable to wear and super soft because of the yarn, Scrumptious by Kolláge Yarns. Scrumptious is a blend of silk and angora and it is really as lovely as it sounds. I hope you'll stop by the bookstore and grab a copy of this issue.